Troy Mills was laid out in 1870. A gristmill and sawmill had existed there previously. ^ a b "Troy Mills, Iowa". Geographic Names Information System. United States Geological Survey. ^ The History of Linn County, Iowa: Containing a History of the County, Its Cities, Towns, &c. Western Historical Company. 1878. p. 601. 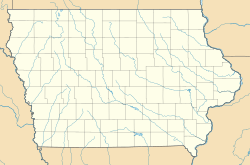 This article about the geography of Linn County, Iowa is a stub. You can help Wikipedia by expanding it. This page was last edited on 29 April 2018, at 18:02 (UTC).